This model of the BOSS Electrical Panel is rated for 120/208V. 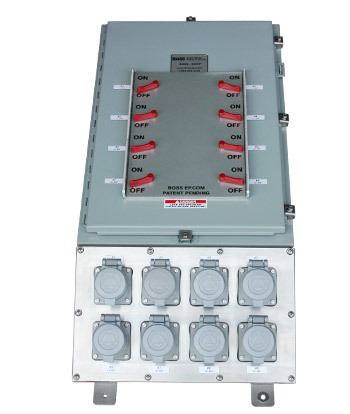 In typical rig configurations, this panel is perfect for managing power for lighting and general duty outlets and equipment. It is the perfect solution for any setting that requires a NEMA 4 panel. Customize this with BOSS 96, Powertite or Arktite receptacles, with or without an extension box, and you've got an incredibly convenient and flexible set up to suit any application. **Interiors are typically 18, 24, 30, or 42 circuits. One breaker is alotted for each 3-circuit spacing to align with door-mounted switches. One switch/breaker for every 3 circuits.